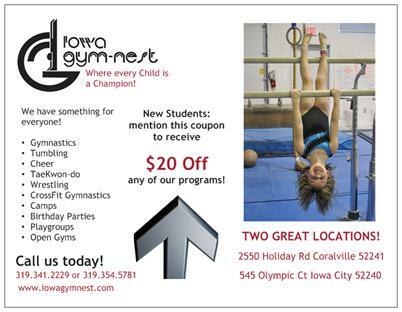 Iowa Gym-Nest offers something for EVERYONE. New students are welcome to join classes at anytime throughout our Sessions. Not sure what class is right for your child? No problem. We offer FREE Trial classes and a money back guarantee! Our staff is highly trained and we offer continuous education to all staff members, so we can offer your child the VERY BEST sports instruction in the Corridor and so much more!